VICTORIA - Call it the brotherhood of the travelling bike. For many Canadian bikers the storied journey of the Harley-Davidson bike from Japan to B.C.’s rocky shores after last years’ tsunami will not be complete until it is reunited with its original owner. Since it was pulled from a remote beach on Haida Gwaii, volunteers have looked after the bike every step of the way ? ferrying it across Hecate Strait and then driving it about 1,600 kilometres from the northwestern, B.C. city of Prince Rupert to Victoria, where it will be shipped back to Japan. Ralph Tieleman (left) helps dealership owner Steve Drane, stabilize the 2004 Harley-Davidson Night Train that was swept to sea during the Japanese tsunami, in Langford, B.C. May 6, 2012. 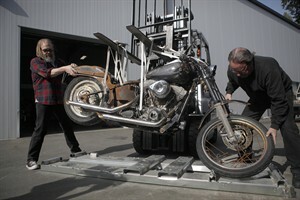 Ikuo Yokoyama’s Harley is nearing the final stretch in its journey home. "I thought, you know, if I lost one of my bikes it would be pretty important to get it back," said Ralph Tieleman, a Tofino, B.C., man and motorcycle enthusiast, who trucked the bike to Victoria. After dropping off the bike at Steve Drane Harley-Davidson Sunday and returning back to his home on the west coast of Vancouver Island, Tieleman figures he’ll have travelled at least 3,000 kilometres. The 2004 Harley-Davidson Night Train bike was caked in salt and damaged by pounding surf, may be one of the most unique and improbable artifacts to hit the west coast of Canada since the disaster. Earlier this year, the U.S. Coast Guard sank an unmanned fishing boat because it was a hazard to shipping and to the coastline. Last month, a soccer ball lost by a Japanese teenager also washed ashore on an Alaskan island. The bike was found in April on Graham Island, the largest Haida Gwaii island, by Masset, B.C. resident Peter Mark. The motorcycle had made it across the Pacific stored in a large container and packed in Styrofoam. Traced through the bike’s licence plates, the motorcycle’s owner was identified as Ikuo Yokoyama, a 29-year-old Japanese man who lost three family members in last year’s disaster. Tieleman, who began riding Harleys at the age of 15, said he heard about the bike and decided to get involved. He said Mark went through exceptional effort to get the Harley, driving about 60 kilometres off road and in a four-by-four to reach the buried bike and winching it out of the sand. The bike was then taken to the ferry and arrived Friday in Prince Rupert, where it was met by Tieleman and his truck. Tieleman said he drove east to Prince George, south to Vancouver, and then hopped on yet another ferry that took him to Victoria. Along the way, people, and even police, stopped to look at the bike, some even taking photos, said Tieleman. "It’s caked in salt and corrosion," said Tieleman, after arriving in Victoria. "There’s rocks jammed everywhere. It got beat up on the beach a bit." The bike’s frame is still good and so are its engine and transmission cases, he said, noting that even the bike’s front end is in good shape. According to a statement, Steve Drane Harley-Davidson will prepare the bike for shipment to Japan, where it will be restored by Harley-Davidson Japan and returned to its owner. Tieleman said the journey provides a powerful lesson to others who find tsunami-related debris on B.C. beaches. "Remember that it’s somebody’s property and what people there went through," he said. "It’s not just junk. At one point, it was part of someone’s life."